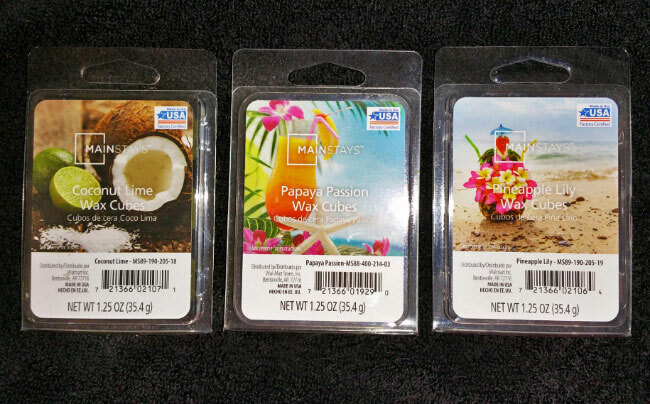 This is a review of the Spring 2019 Mainstays Wax Melts from Walmart (Coconut Lime, Papaya Passion, Pineapple Lily). I was not expecting this scent to smell as good as it does. I expected it to smell like mostly coconut with a hint of lime. But instead, it's a perfect combination of sweet creamy lime and coconut. It's a nice sweet scent with just a smidgen of saltiness, like a creamy tropical lime drink, and it's fantastic. ScentSationals Coconut Lime, Better Homes & Gardens Island Coconut Lime (same scent), and ScentSationals Coconut Vacay smell completely different. Coconut Lime is mostly coconut with a slightly salty lime note, and Coconut Vacay is an even mix of coconut and lime, but the lime is slightly salty and lemony. Neither of these scents are sweet. Yankee Candle Perfect Margarita (Margarita Time - same scent) is a fresh sweet creamy lime scent, and I don't really smell coconut. It's a great scent, but it's richer and more "limey" than the Mainstays scent, with another note that I've never cared for, maybe honey, which sounds great, but it makes this scent too rich. I didn't realize when I reviewed this scent that it actually came out last year. It's tropical fruit scent with notes of pineapple and papaya, and possibly a smidgen of coconut. It's sweet but not overly sweet, and not overly pineappley. A tropical scent that smells almost exactly like Papaya Passion, but a little less sweet, and has a slightly sour fruit note that a lot of tropical scents have (but not in a bad way). I only smell a smidgen of pineapple, and I don't smell any lily or floral notes.